To be honest, I, with my limited decorating skills, was a little intimidated when I saw the book's cover. Would I ever be able to create pink flamingos? Maybe not. But, those fears were unfounded when I opened the cookbook. That's the beauty of this cookbook; it has recipes and techniques for every skill level. 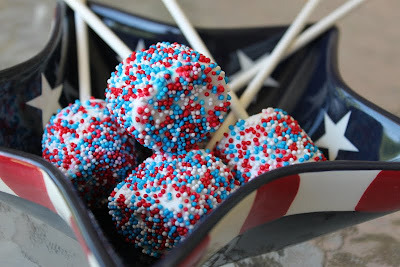 Even for a decorating beginner like myself, I was able to find many treats that I thought that I could reproduce: Fancy Marshmallow Pops using edible icing sheets, Stamped Bug Cookies using rubber stamps and edible writers, Flower Cake Pops, Little Lamb Cake Balls, Licorice Heart Cookie Pops, Easter Egg Painted Cookies, and Zombie Marshmallow Pops. I don't want you expert decorators to fear. There are plenty of challenging recipes here, too. Recipes that will incorporate your painting and molding skills. The end of the cookbook is dedicated to templates to assist you in bringing the recipes to life. Every recipe is accompanied by a full-color photo or series of photos. And, on every treat, you'll get a list of the recipes, supplies, and techniques needed to complete the task. I found this cookbook to be endearing. The more I looked through it, the more inspiration I found. Yes, I think I'm capable of turning out some some creative treats now. I can take the techniques that I learn here to create my own themes. And, that's the best thing that a cookbook can do for you - open your mind and inspire your creativity. Who knows? There could be some pink flamingos in my future afterall. Insert lollipop sticks into marshmallows. Working with 1 marshmallow at a time, dip a marshmallow in a bowl of water, completely submerging it, and quickly remove. Dab the excess water on a paper towel, hold the marshmallow over an empty bowl or plate, and shake sprinkles over it to completely coat. Prop in a Styrofoam block to dry. ﻿With so many sprinkles on the market (and in my cupboard), the possibilities are endless. These create quite the "wow" factor for children and adults alike.